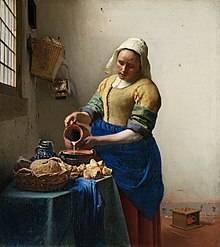 Johannes, Jan or Johan Vermeer (October 1632 – December 1675) was a Dutch painter who specialized in domestic interior scenes of middle-class life. Arshile Gorky in: 'A visit to the Metropolitan Museum with Gorky', Ethel Schwabacher, 1947; as quoted in "Arshile Gorky, – Goats on the roof", ed. by Matthew Spender, Ridinghouse, London 2009, p. 357. Arshile Gorky in: 'A visit to the Metropolitan Museum with Gorky', Ethel Schwabacher, 1947; as quoted in "Arshile Gorky, – Goats on the roof", ed. by Matthew Spender, Ridinghouse, London 2009, pp. 357-58. Germaine Greer. The Obstacle Race (1979) Chapter V: Dimension, p. 105. Marcel Proust In Search of Lost Time (1913-1927) Vol. VII: The Past Recaptured (1927) Ch. III: "An Afternoon Party at the House of the Princesse de Guermantes". Auguste Rodin in: Camille Mauclair (1905). Auguste Rodin: The Man, His Ideas, His Works, p. 65-67. Margaret Thatcher, Statecraft: Strategies for a Changing World (2002), p. 328.